Category Archives for "Vaporizer Pen"
Vaporizer pen news, the best dry herb vapes, the best oil and wax vapes, multi-purpose vapes, learn the benefits of vaporizers. Find the best vape pen that suits your lifestyle and the types of cannabis that work for you. The vaporizer pen industry is relatively new and consistently evolving, we’ll keep you up to date on the newest and hottest products. Today we have a look at one of the best new wax dab pens that was released in 2017. The QLoudUp Nexus Vaporizer is a powerful new pen that has many people interested for a few reasons. The Nexus comes with a lifetime warranty and 3 coils to work with peoples individual vaping preferences. The Nexus pen is priced very competitively at $80 which pits it against other affordable vaporizers under 100. Here we will touch on a few aspects of the Nexus Vaporizer by QLoudUp to see if it performs well and is worth your money. The Nexus is available in a few different color options. As you can see from the images of the Nexus wax pen on this page it is a very sleek modern looking pen. You can get it in matte blaq, ruby red, pearl white, and gun metal. The vape battery is a bit on the weak side, but for a wax pen and how it is designed it hits pretty hard. The battery is a 650 mAh temp controlled battery that has 3 temperatures settings of 340f, 400f, and 460f. You are able to take 20 second draws from the Nexus vaporizer which is more than enough time to get a good hit. The Nexus by QLoudUp comes with 3 different heating chambers/atomizers - it comes with an all ceramic heating chamber which is great for flavor, a quartz crystal single titanium coil atomizer, and a dual quartz crystal titanium coil atomizer for quick large rips. The oven chamber is actually pretty deep. Considering the design makes it so the oven can't have a very wide diameter since it is a slim pen shape they did good job at making the oven a solid size by going deeper. You are able to easily git half grab in the oven chamber. The thread used for the Nexus vape pen is 510 which is typical in wax pens. The device was designed in the US and quality inspected in the US. It has been made with no wicks, glues or dyes. This is important to know that the vapor you will be inhaling is primarily your material and not any left over grit and grind from the manufacturing process. Even still it is still a good idea to run the wax vape pen through a cycle or two on the highest setting with each heating element to give it a burn clean. One of the biggest features of the Nexus by QLoudUp is that it comes with a lifetime warranty. This gives you peace of mind knowing that the company itself is confident in the product they are selling and in the case that anything standard goes wrong with your unit you will be taken care of. 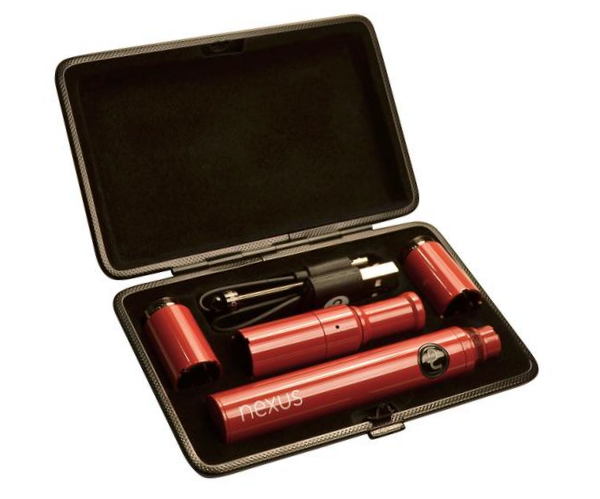 The package that you get with the Nexus wax pen includes the pen itself, the ceramic chamber, the single quartz chamber, the double quartz chamber, a micro USB charging cable, a dabbing tool, the user's manual, and a travel case. The price is right and the hits a pretty good. The Nexus vaporizer is rated as one of the best new wax pens of 2017 and when considering things like the lifetime warranty, the temperature options, the overall build quality, the 3 heating chambers/atomizers and the low price tag we can see why it is a popular new wax pen. The downfalls I see is the less then average battery and the fact that is designed to vape just wax concentrates. If you are looking for a more powerful vaporizer or perhaps one that can vape more than one material you can browse the sections below based on price. One new vaporizer that may be of interest that was also released in 2017 is the Hera 2 which is a touch screen vaporizer designed for dry herbs and concentrates. 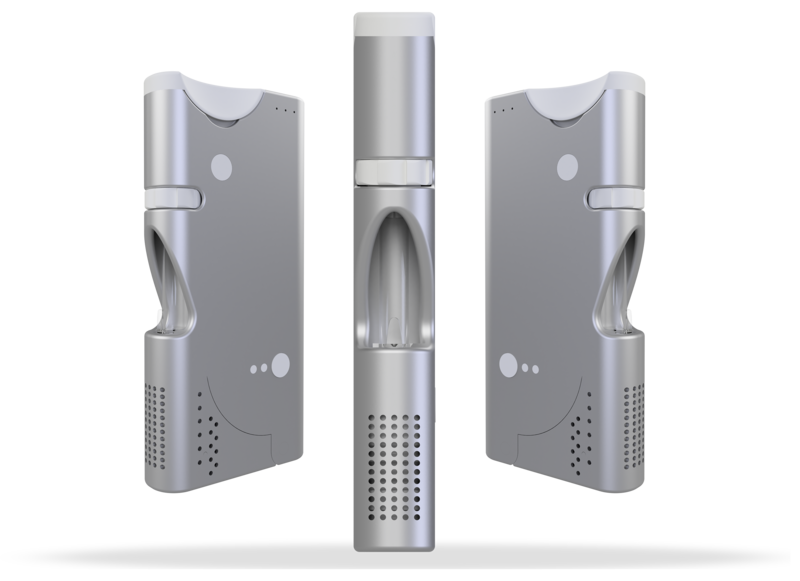 A more expensive top of the line vaporizer that is jsut being released that you may also wish to look into is the Ghost MV1. If you think that the Nexus by QLoud Up is a vaporizer that you may wish to purchase you can do so by visiting there official website here. The portable vaporizer industry has exploded in size in the last few years and shows no signs of slowing down. Vaporizers for both marijuana and for nicotine are in high demand and the number of different devices for both these industries is growing at an unprecedented rate. Vaporizers range in price from under $100 vaporizers to $600 premium desktop vaporizers. Depending on your needs will dictate the device that's right for you. In this article we will touch on the best basic vaporizer devices that are simple and easy to use. A vaporizer is a device that heats up a material and turns it into vapor. A good vaporizer and the point of a vaporizer is to heat the material but to not burn or create combustion (set on fire). A vaporizer is said to be healthier because it does not create the chemical reaction that creates tar and carcinogens. There are cannabis vaporizers and e-liquid vaporizers. Cannabis vaporizers are designed to vape either one or more of the mediums CBD and THC come in such as loose leaf vaporizers and concentrate vaporizers. E-liquid vaporizers usually come in the form of a battery mod and a tank system for the e-liquid. As of recently some vaporizers are all encompassing and are able to do it all - these are known as 3 in 1 vaporizers. Please note - just because some vaporizers are more expensive, or some vaporizers are capable of vaping more materials than others does not mean they are superior. There is a lot that can be tinkered with to find the right formula for a device to be really good at something specific and when trying to make one device do to much it is often that it weakens the other aspects of it. Do your homework and read reviews on the different vaporizers and weigh the pros and cons with what it is your looking for. 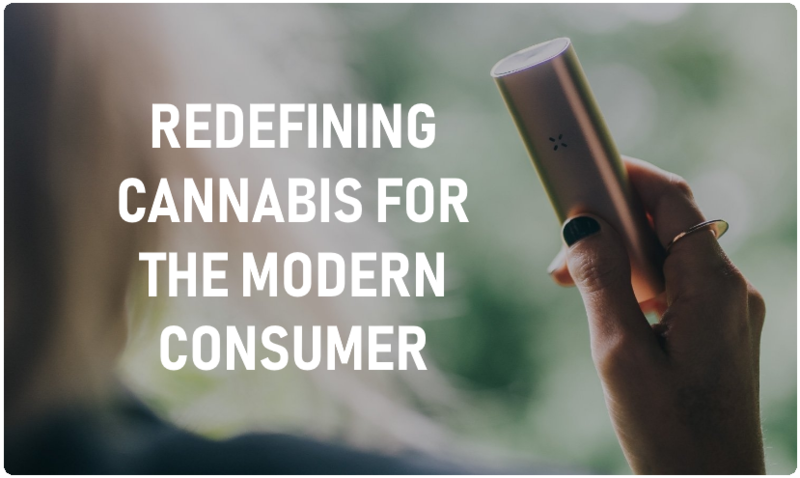 Vaporizers may have not yet made it to the mainstream media or the big electronic stores as a promoted product but this does not mean they are hard to find. You just need to either make your purchase online or go to a specialized store for the type of vaporizer you are after. The best route to take is to make your purchase directly from a vaporizer manufacturer that has a good warranty. A good warranty should be at least one year if not more. Its smart to get a vaporizer directly from an authorized dealer or manufacturer directly is due to the fact that there are many cheap vaporizers and fake replica's floating around that you don't want to buy. If you happen to find the vaporizer you are looking for when browsing this site, we provide links to the official site of each device or a local authorized drop-ship supplier. A new vaporizer for concentrates called the INDVR vaporizer is available that targets the female demogrphics and anyone who likes to accessorize with makeup, lip stick, and mascara. The new INDVR vaporizer resembles the look of your typical cosmetic products which give this new vaporizer a more incognito discrete aspect to it. You can easily through this new vaporizer in your purse or day bag and no one will think anything of it. "Stealthy and Stylish - Hidden in Plain Site"
The INDVR portable vaporizers for concentrates will be available in three different models. The first two being related to cosmetics and are the Lip Stick Vaporizer and the Mascara Vaporizer. 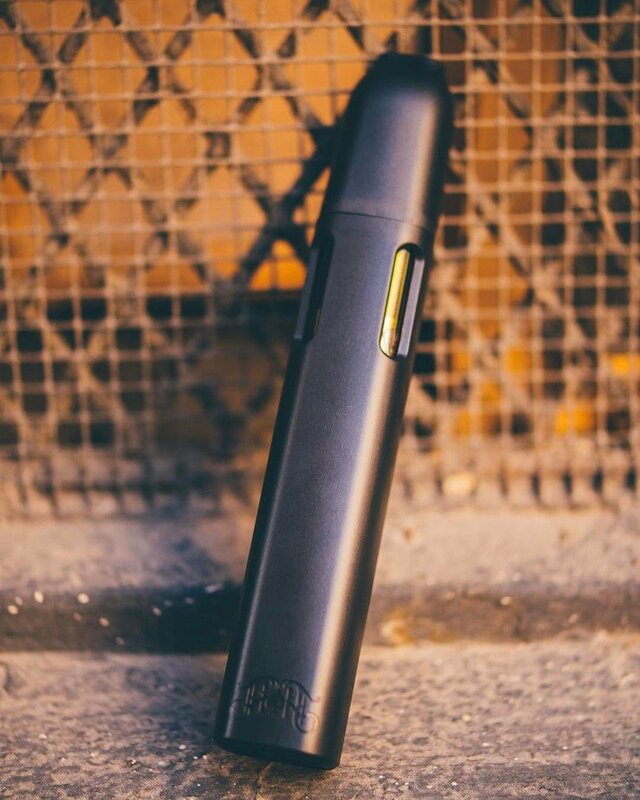 The 3rd and most premium and expensive of the portable vaporizers from INDVR is called the INDVR Elite vaporizer that looks like a pen and actually writes. There are a number of pens that have this functionality but none have managed to become big mainstream products. Perhaps the INDVR Elite will break through and due to its marketing strategy of targeting primarily females will have a bigger chance of success. Have a device that can both vape and write will keep your travel belongings to a minimum and will also allow you to be discrete while vaping out among other people. The Mascara and Lipstick style vaporizers retail for $60 each, while the INDVR Elite pen costs $80. 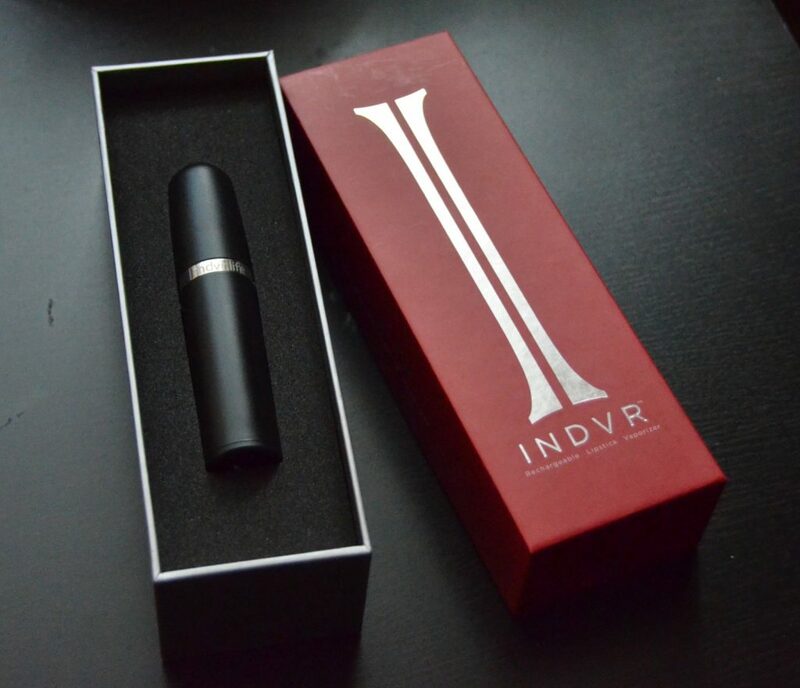 The cartridge that is recommended for the INDVR can be purchased from their dispensary and is just two inches long, this allows for the lid of the lip stick and mascara versions to still fit on. Some other oil cartridges are a bit longer and will not allow the lid to be quickly placed back on and for you to throw it back in your bag discretely. The cartridge you can get from INDVR is prefilled with 500 milligrams of oil and retails for $40. The concentrate cartridge features a ceramic chamber as well as ceramic heating rod. It will provide you clean and smooth vaporizing experience each time. The CloudV vape pen that can write is only $​35. This is a very competitive price for a compact vaporizer that has both the functionality of an oil vape and the quality of a premium writing device. If you pick one of these up (which you can order online here), it is recommended that you first charge your battery by using the 510 threaded USB charger provided in the kit. Then when you are fully charged, to use the vaporizer you unscrew the pen cap and remove the mouthpiece tip. 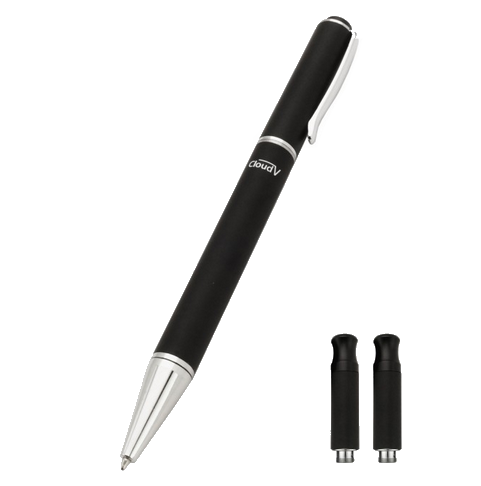 The pen comes with a loading tool that helps you to place your material onto the coil. When the material is in place, screw the atomizer tightly back onto the battery. Then all you need to do is inhale and the device will activate automatically. The package you get comes with the pen battery, 2 concentrate cartridges, a 510 charger, and the CloudV tool to use with your materials. Coming from the company Heavy Hitters is a device called the Quattro vaporizer. This THC oil concentrate vaporizer allows you to combine 4 vaporizer pens into one to get truly massive hits. The Quattro works immediately as you inhale to take a hit. A super unique device that brings 4 vape pens together that you can hit all at once or as a combination of any of the 4 pens. Included in the package you get are different mouthpiece designs that will block 1, 2, or 3 of the pens to limit the size of your hit. For the brave souls, there is the wide open hit all 4 at once mouth piece. 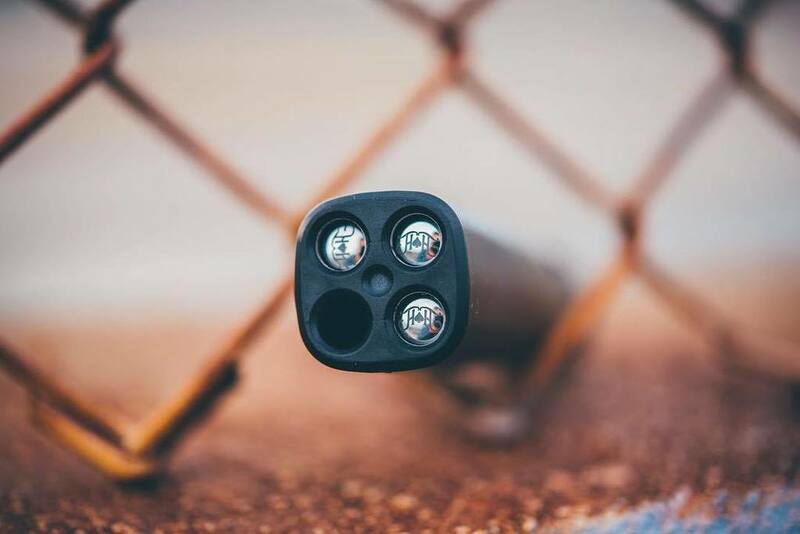 The sides of the case that combines the 4 vape pens has holes that allow the whole unit to stay cooler and not get to hot, and also allows you to see the amount of concentrates left in each vape pen. One of the best perks about the Quattro Heavy Hitter is that you can mix and match the strains to get a nice herbal blend. You can mix 4 of your favorite strains or go heavy on one over the other. The Quattro produces some pretty big clouds, especially for a cannabis vaporizer.. perhaps that is because you are hitting 4 vaporizers at once. 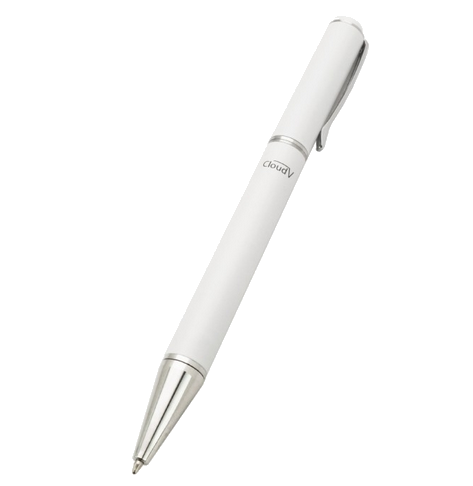 As you inhale the bottom of the Quattro vaporizer lights up which helps to indicate which pens inside are currently functioning. The Yocan Magneto is a new wax vaporizer from one of the worlds largest manufacturers of portable vaping products - Yocan. The magneto is an upgraded version of the Yocan Evolve Plus. The new features of the Magneto make it an even better model with some handy new features. Here we will touch on the components of the Magneto and what these new features are in the Yocan Magneto vape review. 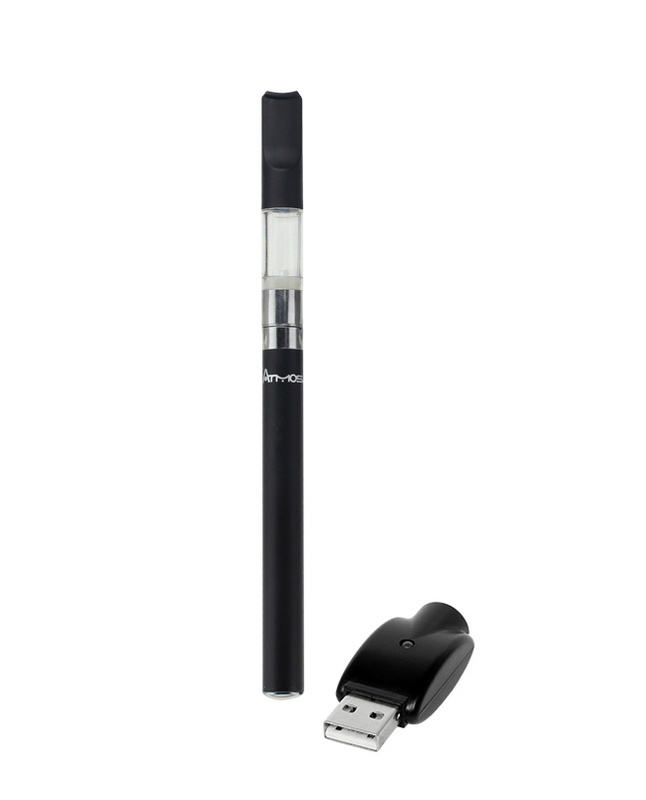 The Yocan Evolve Plus is one of the top wax vape pens on the market. It is simple durable and affordable. The Yocan Magneto uses the same quartz coils and still has the attached canister on the bottom that it has with the Evolve Plus. The device has been upgraded and still has all the same elements as before. The new feature has to do with the magnetic cap, as the new name would imply. The magnetic cap is easier to handle and quick to use. The cap also includes a dab tool which helps to make this device a more complete portable 'operation'. So the two things that have been upgraded from the Yocan Evolve Plus is the magnetic cap for quicker use and a more modern feel, and the attached dab tool. 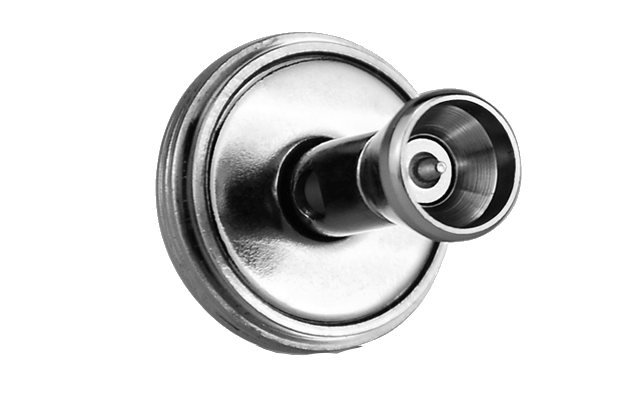 This is a smart feature since dab users understand how having to track down a dab tool every time can sometimes be a hassle, You vape you carry it around.. you leave it somewhere.. it can be time consuming to find it every time. So the attached dab tool as you can see below is a nice touch. So what you see here is the bottom of the magnetic coil cap. You can use this to grab your wax, you make it snap back on and your good to go. Very quick very easy. For the price this is one of the best vape deals for the device your getting. It has the attached silicon jar, micro usb charging, powerful battery, magnetic cap. dab tool, range of colors, tough good looking design. The one thing that is missing that we believe will come in one of the next Yocan models is built in software that will allow the Yocan devices to operate and learn from apps connected to the device. In the image above you can see the silicone jar that is built into the bottom of the device. This holds your wax (2ml non stick silicone jar), the magnetic coil has your tool - you can head out with just your device and have everything you need. 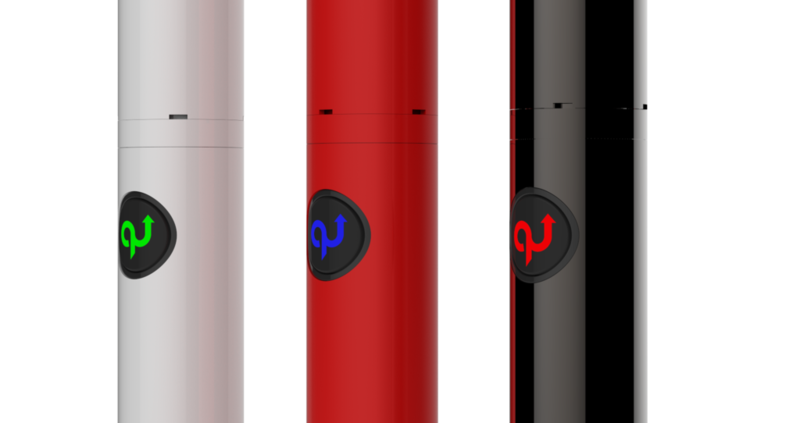 You are able to order the Yocan Magneto is 5 different colors. You can get it in silver, red, black, orange and blue. 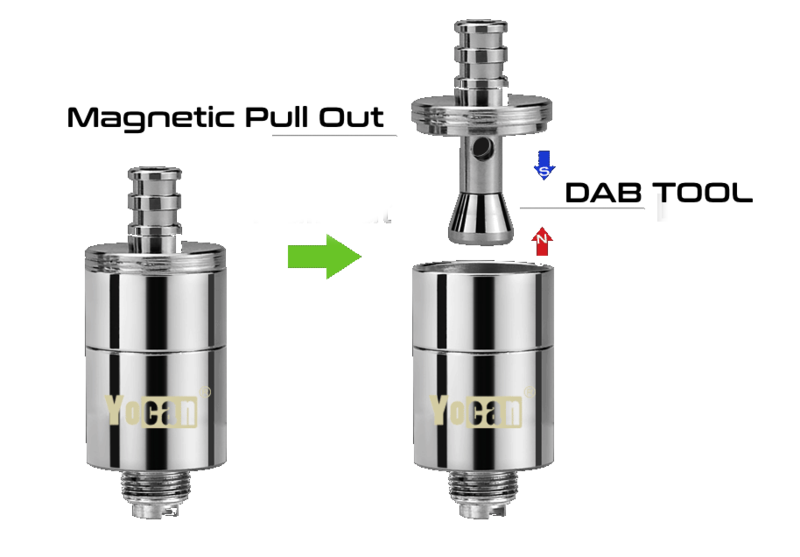 Yocan Magneto Vape Review - Device walk through with information on how this device can be used with your other vaping devices. Tips for other vaping devices towards the end of the video. Thank you for reading our Yocan Magneto vape review, if you like this product it will be available soon. If you would like to be the first to know when they start shipping you can sign up for our e-newsletter. We send out email notifications every once and a while as new and innovative portable vaping products are announced or become available. GoFire Vaporizer Review - The company GoFire, Inc. based out of Denver CO, USA is currently working on bringing a new and innovative portable vaporizer to market. The new GoFire vaporizer has a few features and app capabilities that do not currently exist in any other portable vaporizer. Let's take a closer look to see what sets the GoFire vaporizer apart from the countless vape manufactures that already exist. The GoFire vaporizer is not yet available but is projected to be released later in 2017. If you head over to the official website here you can request a pre order. Many new portable vaporizer companies that create a high demand product can have a hard time keeping up with the initial sales. By placing a pre order you will avoid this issue. Before going ahead and ordering a device that you know nothing about continue reading below to find out what all the fuss is about. GoFire Inc. is creating an image right from the start that will help to setup the foundation for a successful company. They are creating a product that is marketed towards the health care industry. Most portable vaporizer companies take on a different approach and go after the younger generations and recreational users in general. By marketing directly to the recreational cannabis users, many companies have created a product/company image that the medicinal users stay away from. GoFire boosts a premium image that caters to the health care industry. The GoFire Vaporizer is designed to help with alternative therapy and to give you more control over your vaping materials. The GoFire Vaporizer uses precise temperature controls that allow you to choose any temperature between a given range. Metered Dose Control - you are able to control the doses that you take using micro dosing technology. This works for every 5 mg increments that you put into the device. The Application allows you to study and learn what works and what doesn't. You are able to vape both dry herbs and extracts. The GoFire uses SMART Cartridge technology that allows you to identify blended formulas. Particle sensing technology is a new feature that allows you to determine if your material is tapped out by measuring the vapor as an indication. 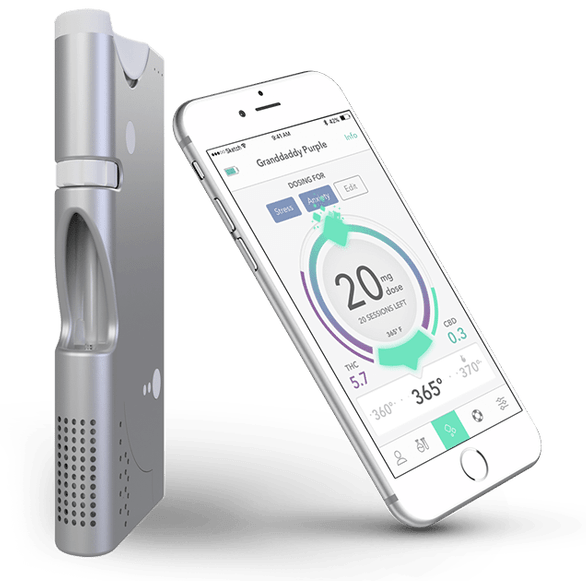 The companion app that will work with the GoFire vaporizer is something that many medicinal users will find very helpful. Users can study the dose levels, compare strands, monitor their sessions and come to conclusions about what works best to get the desired effect for any given situation. The ability to monitor your relief and emotions is something that will actually cater to many people. If you are an artist that is able to summon creativity through the effects of cannabis you will be able to study and perfect the blend and dose amount that gets you to where you need to be. Traditional vaporizers and combustion methods of smoking cannabis is more of a guessing game and it can be hard to tell if and when you have reached your desired level. For some cannabis users that use cannabis for things like stress and anxiety, taking to little or to much will do nothing for you or may do the opposite effect and make things worse. The ability to monitor and study your sessions will help many people find their niche in the dose and strand categories. The GoFire vaporizer can be used to help in certain situations. For example, to help with pain management you can use a 15 mg CBD dominant blend and to help with insomnia with a 10mg CBN dominant formula to get a good nights sleep. Understanding what helps and how to monitor your doses will help optimize the certainty of your desired effects. The GoFire is set to be released in the latter half of 2017. You can learn more about the GoFire portable vaporizer by visiting their official website here. You can also pre order the GoFire portable vaporizer on their website to secure your spot in line. We will update this posting when we get some actual hands on experience with the medicinal portable vaporizer to give you a more in depth GoFire vaporizer review.